by Roy, A. E., Clarke, D.
Roy, A. E., Clarke, D.
Despite remarkable advances in astronomy, space research, and related technology since the first edition of this book was published, the philosophy of the prior editions has remained the same throughout. However, because of this progress, there is a need to update the information and present the new findings. 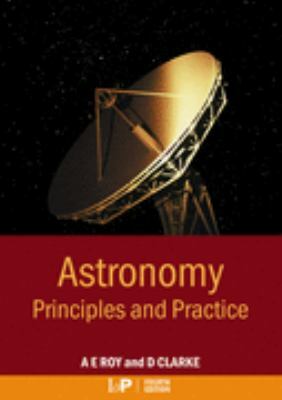 In the fourth edition of Astronomy: Principles and Practice, much like the previous editions, the celebrated authors give a comprehensive and systematic treatment to the theories of astronomy. This reference furthers your study of astronomy by presenting the basic software and hardware, providing several straightforward mathematical tools, and discussing some simple physical processes that are either involved in the astronomer's tools of trade or concerned in the mechanisms associated with astronomical bodies. The first six chapters introduce the simple observations that can be made by the eye as well as discuss how such observations were interpreted by previous civilizations. The next several chapters examine the interpretation of positional measurements and the basic principles of celestial mechanics. The authors then explore radiation, optical telescopes, and radio and high-energy technologies. They conclude with practical projects and exercises. New to the Fourth Edition: Revised values such as the obliquity of the ecliptic Expanded material that is devoted to new astronomies and techniques such as optical data recording A listing of Web sites that offer information on relevant astronomical events Revised and expanded, this edition continues to offer vital information about the fundamentals of astronomy. Astronomy: Principles and Practice, Fourth Edition satisfies the need of anyone who has a strong desire to understand the philosophy and applications of the science of astronomy.Roy, A. E. is the author of 'Astronomy Principles and Practice', published 2003 under ISBN 9780750309172 and ISBN 0750309172. Loading marketplace prices 4 copies from $79.24 How does the rental process work?